Stony Brook’s deepest, darkest secrets were revealed on Facebook about a year and a half ago with the birth of Stony Brook Secrets. 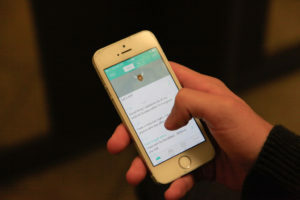 Students have since transitioned to a new social media application called YikYak, quickly putting Stony Brook University on the company’s radar as one of the most active regions in New York, as Seawolves are posting about every 60 seconds. “Just saw two construction workers sitting and laughing. I know what they’re building: Friendship,” Sunday’s top Yak read. Also a popular one, “I have 3 Cs and a D but Facebook thinks I can cure Ebola so I have that going for me,” was posted by another Yakker. The Statesman recently chatted over the phone with YikYak’s Lead Community Developer Cameron Mullen. The interview was edited for space. The Statesman: Tell me a bit about why YikYak was developed. What were the initial goals? Mullen: To tell you a little about the app, how it started, the first version hit the app store November 6, 2013. So about a year ago. And at first, it started out real small and by the end of 2013, it was at two schools. Furman University is where our two co-founders went, Brooks Buffington and Tyler Droll. And the idea, the way it kind of started, was when Tyler and Brooks noticed these anonymous Twitter accounts with huge followings on campus. I don’t know if you have these similar accounts, like Stony Brook Confessions or Stony Brook Problems or Overheard at Stony Brook University. The Statesman: We do, we have all of those. Mullen: Oh you do. Cool. So pretty much, they’re run by an anonymous source, they have tons of followers on campus and Brooks and Tyler kind of thought, “There are more than five funny people on campus. What if we created that platform that acted as a virtual bulletin board for your area?” They thought user names and profiles weren’t important and connecting through your location, YikYak creates kind of a bulletin board for your area. So you can view the most recent hundred posts within a two miles radius. And since then, it’s grown significantly. At the end of 2013, we were at two colleges. We started to spread like crazy in the spring and by the end of that semester we were at about 300 colleges. And people went home for summer, told all their friends about it and when school started up this year, it exploded with popularity at a bunch of new communities too and now we’re at over 1,000 colleges. The Statesman: Where in the country is Yik Yak used the most? Mullen: It kind of depends on how you want to measure it. It’s pretty much based on communities. Right now, a couple of these big schools in Florida are using it like crazy. New York is actually our most popular state, has the most users in it currently. But we’re really starting to see a lot of growth on the west coast right now. The Statesman: What other countries are you in besides the United States and China? Mullen: Our biggest country by far is the U.S., and we’re just starting to grow internationally. So the United Kingdom, Canada and Australia are some of our big countries. The Statesman: It seems that a lot of Stony Brook Yakkers want to post pictures soon. Is that something YikYak is working on? The Statesman: Are there any plans to monetize? The Statesman: 38 percent of students use YikYak, but less than one percent of students vote in our Undergraduate Student Government elections. That’s a huge difference. Do you have any ideas as to why students use YikYak more than they vote for their student representatives? Mullen: In general, more and more people use Facebook than vote in the presidential elections. I think one big reason is it’s probably easier to download YikYak than it is to get out of your bed and go down to the poll to go vote or log in to the poll, or however you do it at your school. It’s hard to say. I’m sorry that that’s such a low number! The Statesman: Someone at Suffolk County Community College, which is more or less just down the road from Stony Brook, thought it would be funny to post a bomb threat on YikYak. Obviously, law enforcement took it seriously—it turned out to be nothing. What would you say to people who would point out the setbacks to using this app, because it is anonymous? Mullen: In general, anonymity can kind of breed not the best behavior, but in terms of threats like this, it’s really not a problem specific to YikYak—it’s more of a function of YikYak getting bigger and bigger and bigger. And, you know, there are bad apples in the world. And they are not just posting threats on YikYak. Like, Facebook and Twitter and YouTube are full of threats like this and that are dealt with all the time…I think one thing you’re highlighting, and not just through threats, but on YikYak, anonymity is a big part of it. And it gives power to the individual to speak about things that they might not otherwise speak about in person or on other social networks, which is really valuable to talk about. Really meaningful discussions and give a voice to people who might otherwise not have one, but we realize it can sometimes breed not the best behavior. The Statesman: So what is the Yakarma used for exactly? Or what is its role within the app? Mullen: On YikYak, it’s kind of like your reputation among other Yakkers. It’s an interesting thing because YikYak is totally private, right? There are no names. So when you have this score, it doesn’t show up on your Facebook page or anything like that. It’s something that you’re internally proud about. I feel like people definitely share it with their friends, like bragging rights almost. 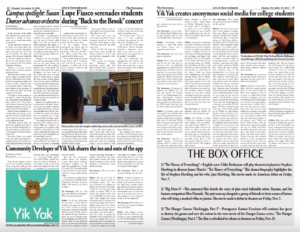 The Statesman: What would you say that most users of YikYak use the app for? Mullen: They use it to post news about what’s going on campus. They post about a crazy deer running through their campus. They’ll post about a big party going on. They’ll post about a new school rule. At Franklin and Marshall, what happened earlier this year is the school made a rule where freshmen couldn’t go out for the first month of school or something like that to fraternities. And the rule backfired. A number of students ended up being hospitalized, a number of freshmen, and long story short some student posted on YikYak like, “Guys, this rule is ridiculous. Everyone come to this building from 1 to 5 p.m. and sign a petition so we can get this rule revoked.” And long story short, they got so many signatures within a week, the rule was revoked. We also see situations of people just looking for support. Someone posts, you know, “My parents are getting divorced and it’s really hurting but I need to stay strong for me and my brother,” and they’ll get a ton of upvotes and people responding, “Look, the same thing happened to me, just stay strong it’ll all be great.” We also see people using it for news. A lot of time, people go on YikYak for light humor, whether they’re checking it before bed or they’re posting something to see how many upvotes it gets, to see how funny it is. It’s a new medium where your content is judged on content alone and not who you are. So if you post a Yak that you think is a really funny joke and it gets four downvotes, the downvotes don’t mean you yourself isn’t funny, it means the content isn’t funny. This is way different then on Facebook when you judge something not by the content but by who’s saying it. It lets people talk about more sensitive issues and get a more honest, objective opinion of the content. The Statesman published this piece in print on Nov. 10, 2014. The Statesman: So would you say that that’s what’s more exciting about the app to you? Or is there something else? Mullen: I feel like everyone identifies with the campus around them, so the content often reflects what’s going on. And we see that it is often full of jokes and funny thoughts, but once something dramatic does happen on campus, or an event happens, you can turn to YikYak and it turns into this real news source. One story: there was an armed robbery at a campus in the south and people were posting, “There was a post about a white Buick that just did armed robbery at the grocery store. Watch out for it.” Kind of like a PSA announcement. Apparently, people saw that on YikYak way before the police department even sent out a mass email to the school. When you think about Twitter, Twitter came out and everyone looked at it like, posting what I’m having for lunch. And that turned into the best news source at times. And we think we can challenge that. We just released this new feature, I’m not sure if you’ve heard of it, called Peek Anywhere. It lets you actually drop a pin pretty much at any location around the world and see the Yaks from that area. So, you can imagine if you want to peek into your friends’ universities to see what’s going on, or if there are the Oscars going on, or you want to see the riots in Hong Kong or, you know, if you want to see what’s going on in New York City during Fashion Week, you can drop a pin anywhere in the world and you can see news coming and posts and Yaks from that location. 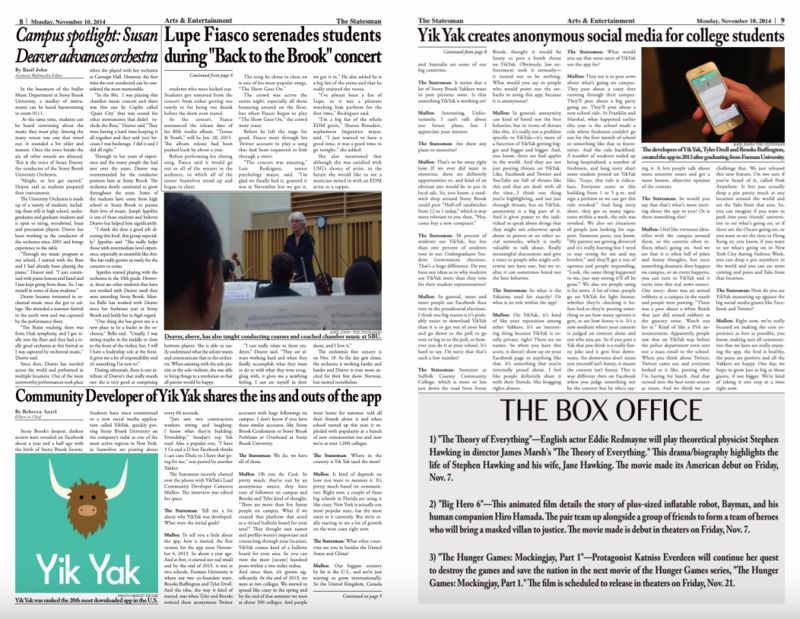 The Statesman: How do you see YikYak measuring up against the big social media giants like Facebook and Twitter? Mullen: Right now, we’re really focused on making the core experience as best as possible, you know, making sure all communities that we have are really enjoying the app, the feed is healthy, the posts are positive and all the Yakkers are happy. One day, we hope to grow just as big as those giants, if not bigger. We’re kind of taking it one step at a time right now.